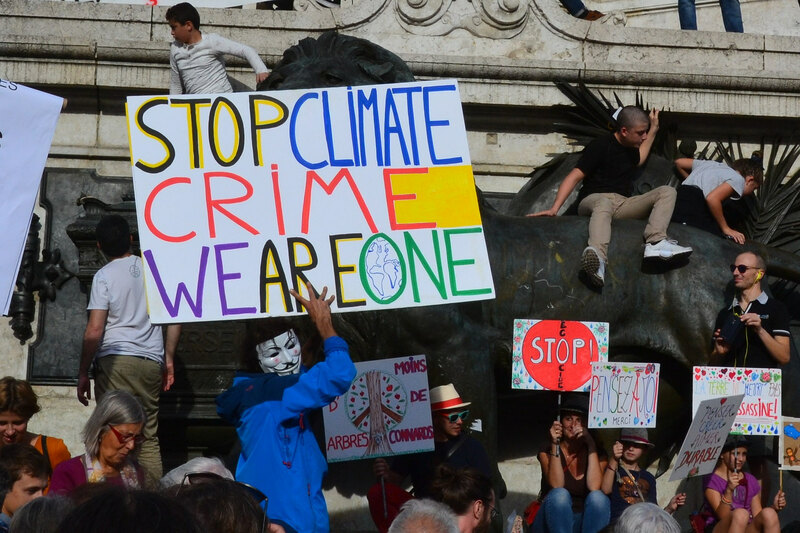 Climate change, its antecedents and sequelae have been nominated as the globe’s top threat in 2019 by both the World Health Organisation and the World Economic Forum, with the latter warning we are “sleepwalking into catastrophe” on environmental destruction. 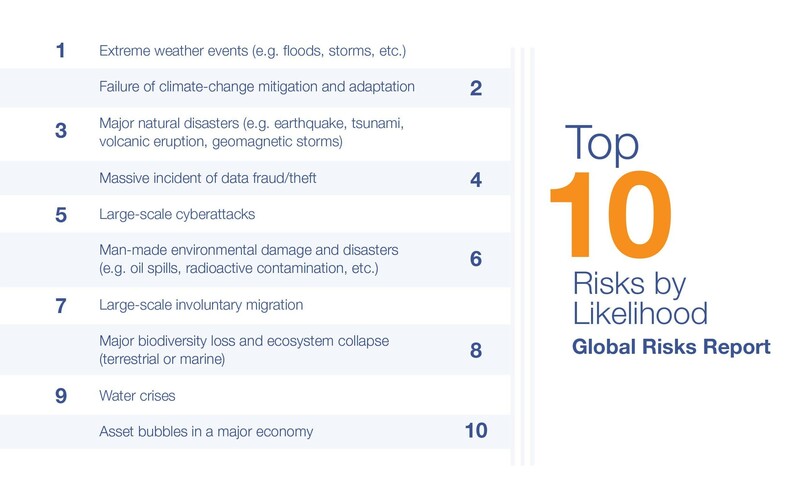 Seven of the World Economic Forum’s Top Ten Global Risks for 2019 are either directly or indirectly linked to climate change, with environmental risks dominating the list for the third year running. 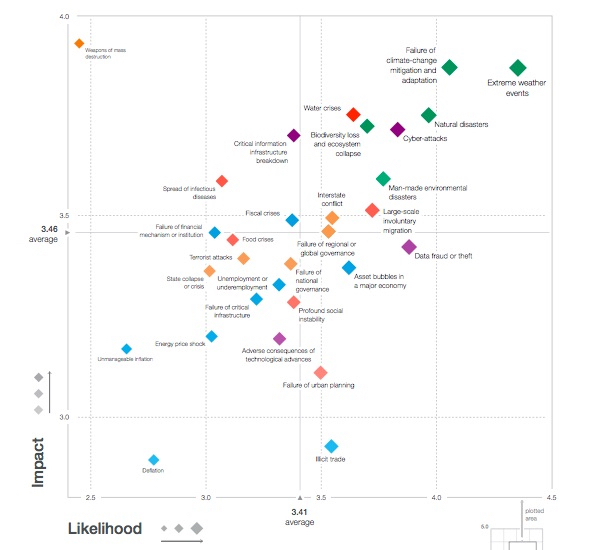 The full report warns that the results of climate inaction are becoming “increasingly clear”, with biodiversity loss accelerating at an alarming rate (60% loss of species abundance since 1970) and impacts on “health and socioeconomic development, with implications for wellbeing, productivity and even regional security”. 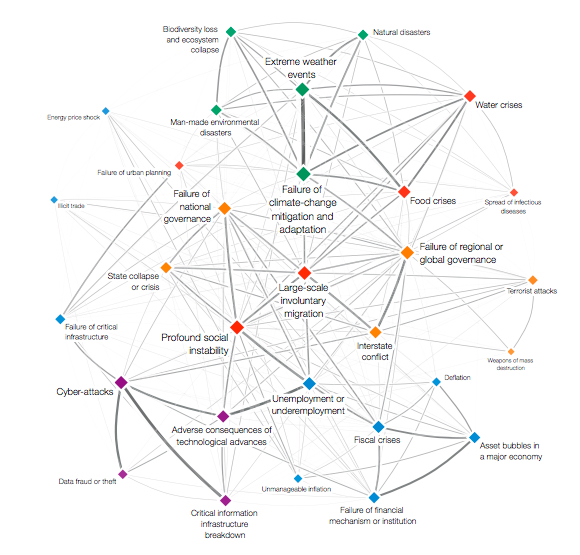 The WEF report values “ecosystem services” — environmental functions with human benefits like drinking water, pollination and flood protection — at US$125 trillion per annum, two-thirds higher than global GDP. It warns that some 2 billion people are now micronutrient malnourished, with increased atmospheric CO2 affecting the nutrient composition of staples like wheat and rice and millions of people likely to be iron, protein and zinc deficient by 2050. Food insecurity, global production freezes and waste upheaval (as seen with China’s 2018 import ban) are only likely to become more frequent, the report warns, with current warming trends to endanger the crop yields of some 1.8 billion people. 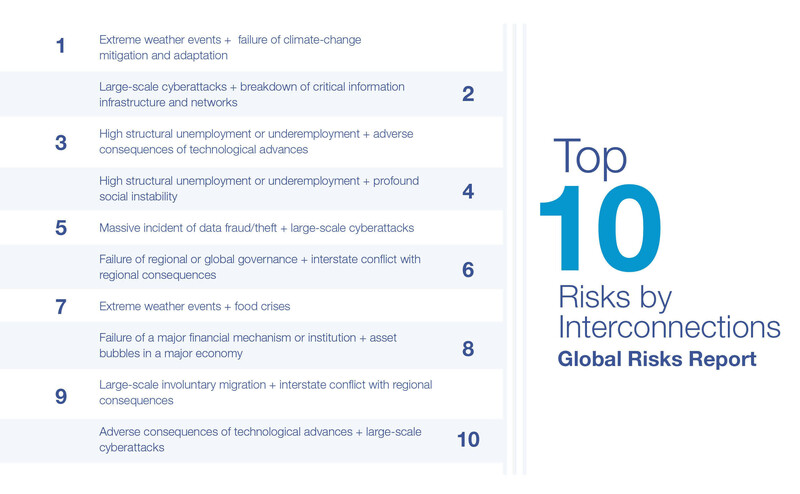 It also features entire chapters on sea level risk, biological threats and social unrest. 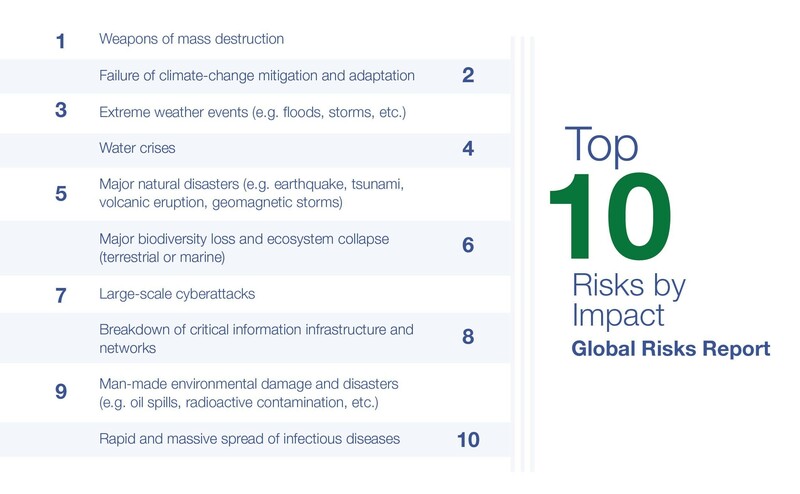 The World Health Organisation has also nominated climate change and air pollution as its top threat to global health in 2019. It projects a quarter of a million additional deaths between 2030 and 2050 as a result of global warming (from the effects of malnutrition, malaria, diarrhoea and heat stress), and says seven million people die prematurely every year from the impacts of pollution — 90% of which occur in low and middle income countries. Communicable diseases including a global influenza pandemic; outbreaks of Ebola and other high-threat pathogens; dengue and HIV also make the list, along with vaccine hesitancy and antimicrobial resistance. Noncommunicable diseases such as diabetes, cancer, heart disease — which are responsible for more than 70% of deaths worldwide — and their risk factors (tobacco, alcohol, physical inactivity, unhealthy diets and air pollution) are highlighted, along with mental health issues. Fragile and vulnerable settings, where protracted crises of drought, famine, conflict and displacement leave some 1.6 billion of the world’s citizens without access to basic health care, and the ongoing global issue of weak primary care (highlighted in October’s Astana Declaration) are both singled out by the WHO as health risks.